Even though it’s all tightly regulated under the GTE race car spec, Porsche really doesn’t like to show off the rear end of its mid-engine 911 RSR race car. Fortunately, all it took to get a good look today was driver Gianmaria Bruni running the No. 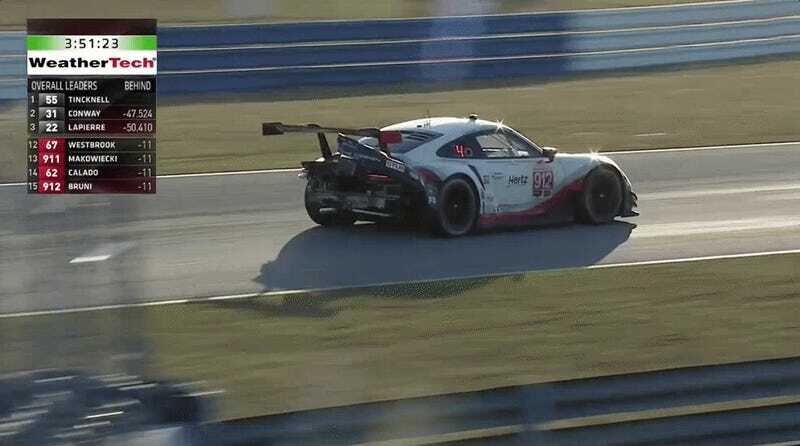 912 Porsche wide off one of Sebring’s curbs, ripping the rear bodywork off the 911 RSR for all to see. A trench had been dug by various race cars’ tires outside turn 13 by hour eight of today’s 12 Hours of Sebring, creating a steep drop off the edge of the track that was a bit too much for the 911 RSR’s low ride height to handle. Much of the rear end of the 911 RSR was ripped clean off in the process, including the undertray that came off in one piece and most of the back of the car. A chunk of the rear of the car flopped around on the rear a little while longer, but later came off. Porsche 911 RSR undertray, chillin’. 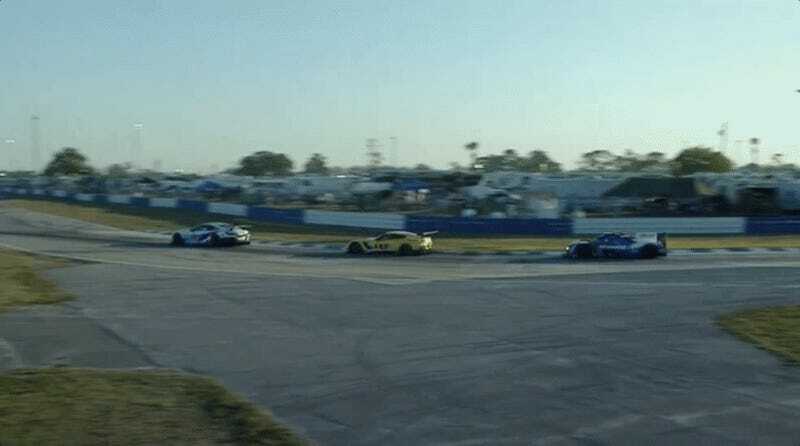 The chunks of Porsche were left on the exit of Turn 13, giving Madison Snow in the No. 48 Paul Miller Racing Lamborghini a bit of a scare as he had to dodge it at the last minute. 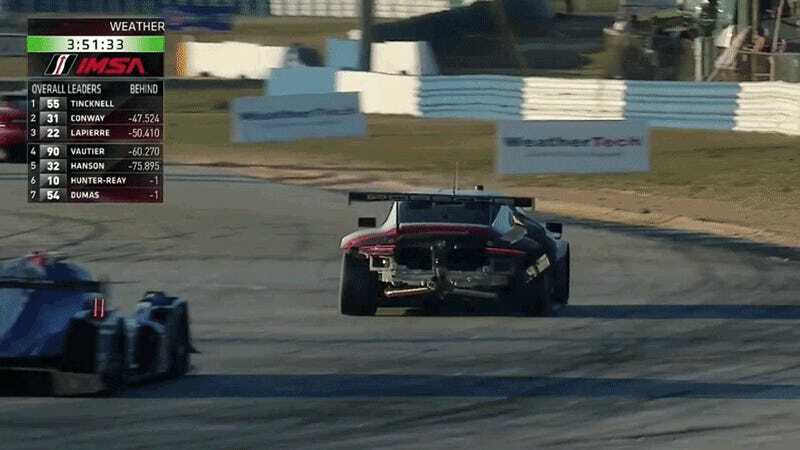 Marshals had to pull the dropped chunk of race car out of the way. But the rest of us got a good look up the highly guarded rear end of that 911 RSR. Photos have come out of the bare shells and the engine bay without the cover in the way, but a view right into the rear of the car is rare. Here we see how the exhaust is routed up and out the middle of the rear and everything. Neat. Repairs were fairly simple, as like any good modern endurance car, whole chunks of the 911 RSR’s rear end bolted right on with only a few fasteners. With just over three hours to go, the No. 55 Mazda (!!!) leads the race overall, the No. 911 Porsche 911 RSR leads the GTLM class and the No. 93 Acura NSX GT3 leads GTD. The Mazda, which ran well in the dark in practice, has a sizeable 55-second lead at the moment, but it’s due for a pit stop soon and the other class leaders are separated by mere seconds. There’s still a long way to go, though, so we’ll see what kind of mayhem happens from here on out. Sorry, Porsche: A Car With The Engine In The Middle Is "Mid-Engine"